Hosted by Jon Kulp on 2019-02-28 is flagged as Clean and is released under a CC-BY-SA license. Since my daughter has been learning a bit of guitar in the last several months, I've actually gotten my old electric guitar and amplifier back out again after many years in the closet. 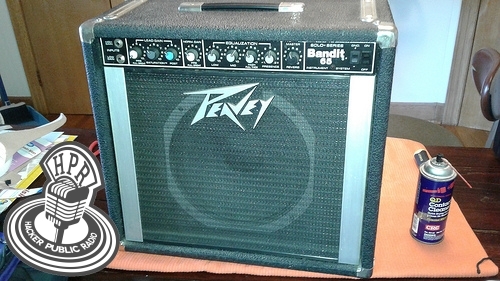 The amp is a Peavey Bandit 65, which was a an affordable solid-state workhorse kind of amp back in the mid-80s and I've had it since it was new. In this episode I talk through the process of removing the brains of the amp and cleaning the potentiometers to try to get rid of some of the static that's happening when I turn the knobs. I also discover belatedly that the reason I was not getting any distortion when I turned the saturation up was that the amp was stuck on the clean channel — shows how long it's been since I used the amp, I kind of forgot how the thing works! Music bumpers are from Kimiko Ishizaka's The Open Goldberg Variations: http://www.opengoldbergvariations.org/, used by permission of their CC0 1.0 Universal (CC0 1.0) Public Domain Dedication license. Stealing a show I had planned, Jon! All right, all right. You beat me to it fair and square. BTW, there is contact cleaner that is specifically made for music gear and it does contain a lubricant. Its made by DeoxIT and the line of products is called Fader (Their font choice on 'Fader" looks awful familiar! You might have a problem with the foot pedal. I had this same issue in the past. You might be stuck in NORM GAIN. And the pedal is not switching into LEAD GAIN (where the Saturation is). The problem I used to have is, the 90 degree jack for the foot pedal does not retain/grip the cable in any way. Any tug on the cable can break a solder joint inside. Its something to check out. Its only a couple screws. Good luck! And get some hair spray! Haha Sorry, Bill! Please do the show anyway. I think the foot pedal is actually working fine, it's just that I didn't realize it was switched over to the other channel while I was working on the amp and the foot pedal wasn't actually plugged in at the moment. I realized my mistake when I plugged the foot pedal in and stepped on it and suddenly saturation was working because it was on the right channel.